Discover some of the hottest wedding looks we'll see this year. Every year, new trends emerge in fashion, design, beauty, and of course, weddings. We’ve seen the rise of flower walls – perhaps made popular by Kim Kardashian and Kanye West’s nuptials in 2014 – as well as signature cocktails, rustic wedding décor, barely there bridal gowns, and mismatched bridesmaid dresses, but we’re always excited to discover the latest décor ideas that will become trends of their own. To get an insider’s look into the wedding trends that will take brides and grooms by storm in 2018, we asked some of the wedding planners, designers, and florists in our Editors Circle to share their predictions for the latest looks that will be chosen by couples this year. Take a look at their opinions below, and let us know if you’ll be incorporating any of these details into your own ceremony or reception! Instead of the "first look" that has become popular between the bride and groom, Merilee Hennings of EverAfter Events predicts that we'll see more "first looks" between the bride with her father as well. 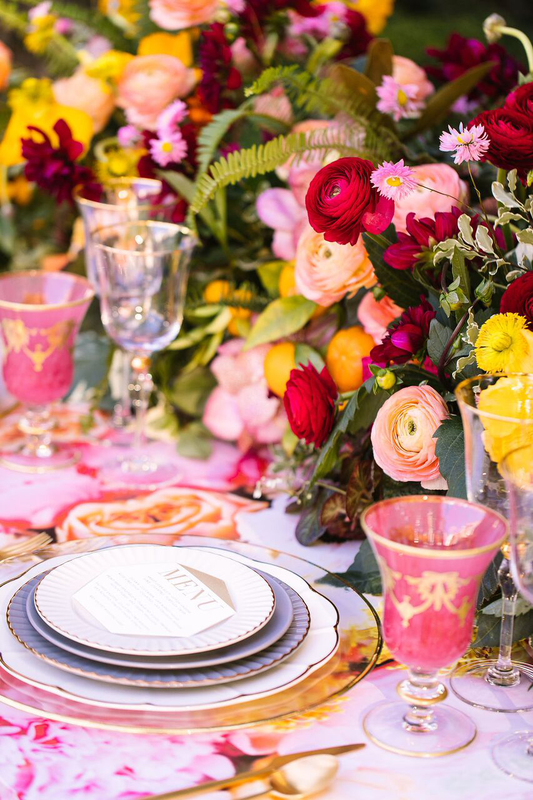 While the mismatched trend has become popular in recent years for bridesmaids, Suzanne Reinhard of Suzanne Reinhard Events predicts 'maids will begin to wear more prints – including romantic floral motifs. Instead of various necklines or hues, bridesmaid dresses will incorporate coordinating prints. While ivory and blush will continue to be popular wedding hues, we're excited to see more colorful celebrations in 2018. "The 'Color of the Year' – Ultra Violet – has kicked off a departure from 'blush and bashful.' Reds, rich blues, and yellows are making a return," shares Suzanne Reinhard of Suzanne Reinhard Events. Andrea Eppolito of Andrea Eppolito Events agrees: "I believe we will see a lot of spaces drenched in color this year. Couples are getting more educated, more daring, and they are ready to make big statements in bold tones this year." "The cocktail bar is becoming a major design focal point for wedding celebrations, crafting not only the couple’s favorite libations, but personality and style in the setup," notes Nahid Farhoud of Nahid's Global Events. "From spirited backdrops to tequila tasting menus, the bar is now the hot spot to bring in customized cheer." Bohemian-chic and rustic weddings have made bouquet styles that look freshly picked from the garden more popular, and we'll likely see more of this in 2018. "A garden-like feel is becoming more popular in wedding floral design. 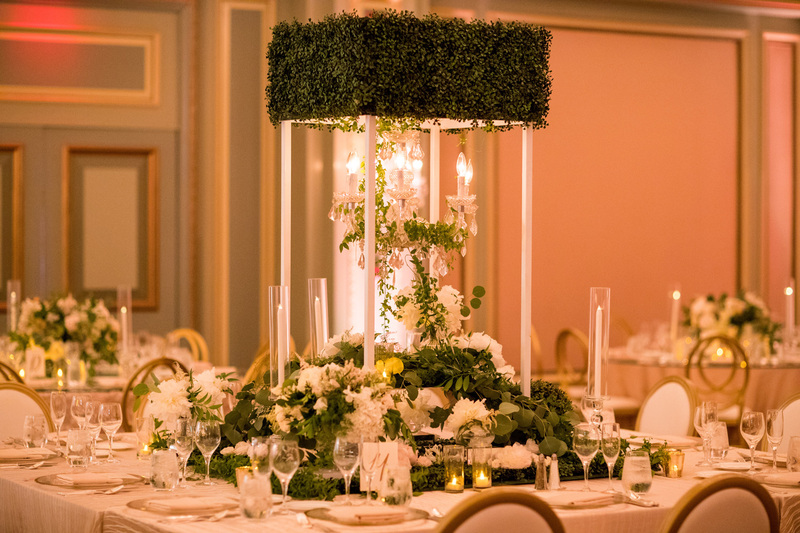 Instead of the tight ball shape, we're designing more natural, textural shapes for centerpieces," says Inna Savluk of Butterfly Floral & Event Design. Emily Clarke of Emily Clarke Events predicts that we'll start to see impactful graphics mixed with floral and other unique textures. "Consider installing custom vinyls – whether custom-printed or even hand-painted – onto tabletops in order to create a colorful, multifaceted design,” she suggests. "I'm seeing more and more couples narrow their guest lists to create weekend-long destination wedding experiences for an intimate group of their closest friends and family," says Callista Osborn of Callista & Company. "Staying at a boutique hotel or private estate keeps everyone close by, and moments throughout the weekend become almost as special as the big day. Thoughtful details and personalized touches are key, as is introducing your guests to the best food, beverage, music, and culture your wedding destination has to offer." While ballrooms will always be one of the most popular settings due to their many benefits, 2018 will likely bring about more celebrations alfresco and in light-filled rooms. Lucy Diaz-Flores of Bella Flora of Dallas sees the "use of natural light and 'airy' venue settings" being popular versus "heavy textiles within a ballroom." In addition to more colorful arrangements, this year will likely see unique centerpiece designs that will wow guests. 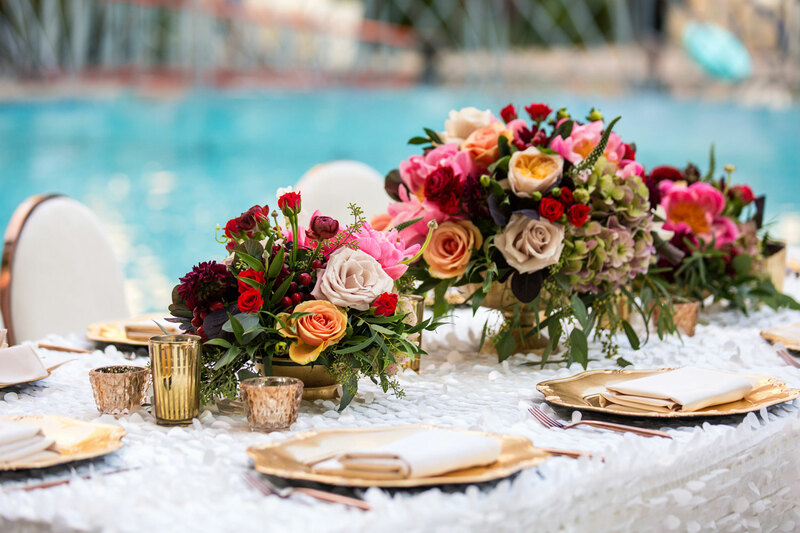 "Eclectic centerpieces, like an upside down 'lazy susan' or hanging tabletop chandelier, are taking the place of traditional floral arrangements," suggests Nahid Farhoud of Nahid's Global Events. Inna Savluk of Butterfly Floral & Event Design predicts that we'll see couples paying more attention to what goes on their reception tables. "Tableware such as goblets, chargers, and napkins are being chosen with more discretion to bring extra depth to event design," she explains, also noting that "making bold color choices creates high-impact design." 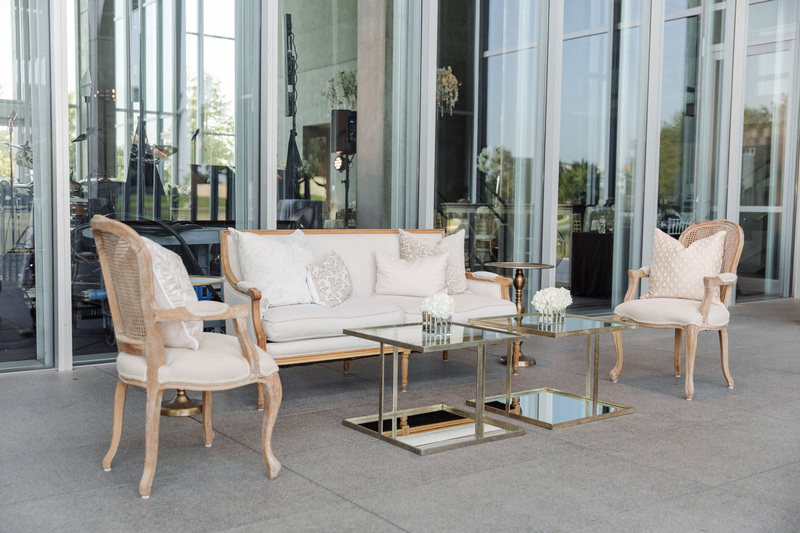 "We see receptions in 2018 leaning toward a more residential feel thanks to the incorporation of custom lounge seating and furniture, which adds to the overall event design rather than just filling empty space," shares the team at DFW Events. Much like the popular "progressive dinner" in which friends have pre-dinner drinks, appetizers, entrées, and desserts at various locations, the team at DFW Events predicts a similar trend for weddings: "The ceremony, cocktail hour, dinner, and dancing will all take place in different settings, giving brides the opportunity to incorporate a variety of décor and design styles into one event." As much as we'll see more color this year, Nahid Farhoud of Nahid's Global Events also believes that monochromatic palettes are on the rise. She states, "The glamourous 'old Hollywood' styling is back with this simple black-and-white color palette accented with only silver, gold, or rose gold accents." Merilee Hennings of EverAfter Events believes this wedding tradition is one of the past that most couples will ignore in 2018. She also predicts that we'll continue to see "open" photo booths with a customized backdrop to entertain guests throughout the reception. For more wedding ideas, discover the trend of reception tables without linens, find out how to host an intimate celebration, and learn ways to give back during the planning process. Also, if you got married recently and you’d like to submit your bridal shower, rehearsal dinner, or wedding, we’d love to see your submissions! Please submit your celebrations here.